Relish your taste buds with fresh, hygienic and tasty halwa with an unmatched collection of halwa making machine. 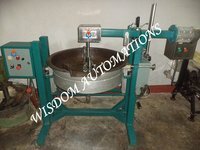 We have been offering durable and heavy duty range of making machine of halwa designed from high grade stainless steel. Fully constructed using optimum grade stainless steel body, the collection is a perfect combination of durability and sturdiness. We have been offering food safe and hygienic range of machine with unmatched production capacity. With non sticky moulds and containers, the range ensures to provide the best performance. We have been offering fast as well as convenient range of machine to prepare delectable halwa. In addition to this, the range also saves time and labor that provide the best value of money to the clients. Safety devices are also available with the machine to provide complete security and protection to the user. Low noise operations and maintenance free design are ensured for years.